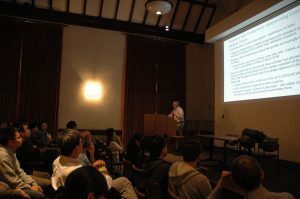 Jerry Hausman, the John and Jennie S. MacDonald Professor of Economics at MIT, gave the inaugural Lecture of the Masters in Applied Economics Distinguished Speakers Series. The talk was entitled “Future Productivity: Pessimistic and Optimistic Viewpoints” and discussed the future evolution of productivity. Professor Hausman spoke about the changing roles of human and intellectual capital, and their relation to social welfare. He described the pessimistic view espoused by Robert Gordon of Northwestern University, that declining marginal productivity is an inevitable historical trend. Professor Hausman then described his own, more optimistic, perspective. He sees the technological advancements in Biotechnology and Artificial Intelligence to be the key driver for productivity growth. Keeping in mind the productive “Bell Labs” model, he suggested more governmental support for research and development. The MAE Distinguished Speakers Series will feature three speakers a year. The next speaker will be Professor Richard Blundell, University College London on Thursday, February 9, 2017 at 4:00pm in Public Affairs #1246.